"This green salad is a meal in itself with smoked turkey, blue cheese, avocado slices--and more--tossed with Champagne vinaigrette." Whisk together olive oil and Champagne vinegar. Place greens in a nonreactive serving bowl and drizzle with vinaigrette. Toss to coat. Add remaining ingredients to greens, season with freshly ground black pepper and lightly toss. 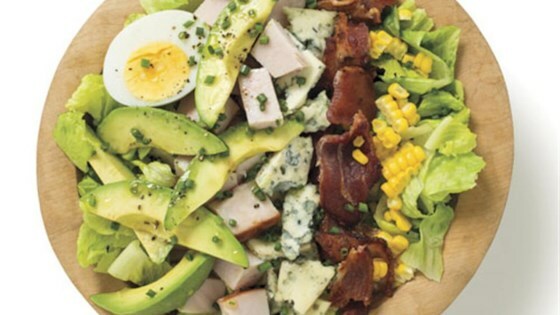 This classic main-dish salad stars eggs, crispy bacon, chicken, and avocadoes.